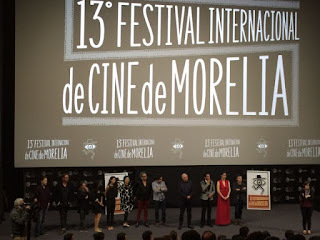 To the Morelia International Film Festival, four hours drive west of Mexico City. Morelia is a modestly sized city but punches above its weight: it's a UNESCO World Heritage Site of beautifully preserved Spanish colonial architecture complete with famous aqueduct, hosts an annual classical music festival and is the headquarters of the world's third largest cinema chain, Cinepolis. This last fact was partly instrumental in creating the major film festival, now in its 13th year. For ten days the town is completely taken over by film-makers, fans and critics. A bit like the Hay Festival and its annual influx of writers, publishers and literature lovers (and funnily enough Hay has a mini-fest taking place in Mexico City this weekend). We've curated a big British programme this year comprising new films like High Rise, Amy, The Program and Suffragette; a Sci-fi package (Things To Come, The Day the Earth Caught Fire, 2001 A Space Odyssey, The Man Who Fell To Earth and an outdoor screening of Blade Runner), the Bill Douglas Trilogy; BAFTA Shorts; Shaun the Sheep, David Bowie Is; and helped bring three guests of honour over. Stephen Frears arrives Monday, but today we had Tim Roth and Peter Greenaway in town to introduce their most recent endeavours. Roth starred in Greenaway's The Cook, The Thief, His Wife and Her Lover way back in '89, but apart from that they've been on very different career paths. 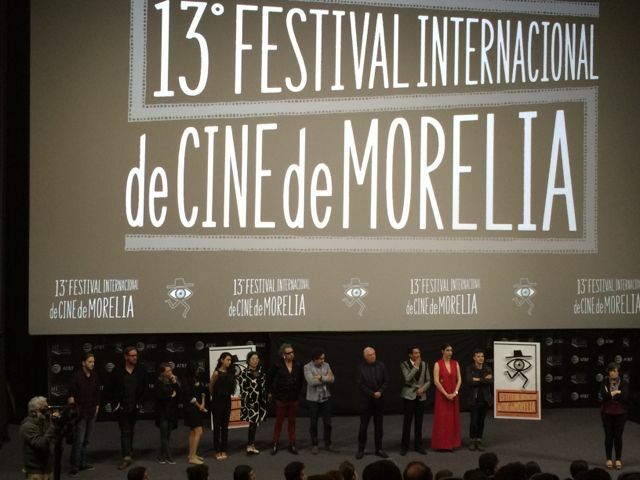 Interestingly, Roth's two most recent films are Mexico-related. Chronic was directed by Mexico's Michel Franco. The subject is euthanasia so not much fun, but great performance nonetheless. And 600 Millas, also showing at the Festival, is directed by Mexico's Gabriel Ripstein. Roth said he wanted to return here and pick up on his directing career. (I hadn't realised he'd already directed a film, The War Zone, in 1999). Greenaway's latest film also has a strong Mexico connection. Eisenstein in Guanajuato is about the Russian film director Sergei Eisenstein's short stay in Guanajuato (100 miles north of Morelia) in 1931. It's typically weird and provocative, beautifully designed and filmed, brilliant and preposterous. Putin doesn't like it at all as it confirms, pretty graphically, that Russia's most famous film director was gay.